In a Doomsday survival scenario, you might need night vision for both security and other reasons when you are outdoors and it is too dark to see. You can spend a lot more on better Night Vision Monoculars. 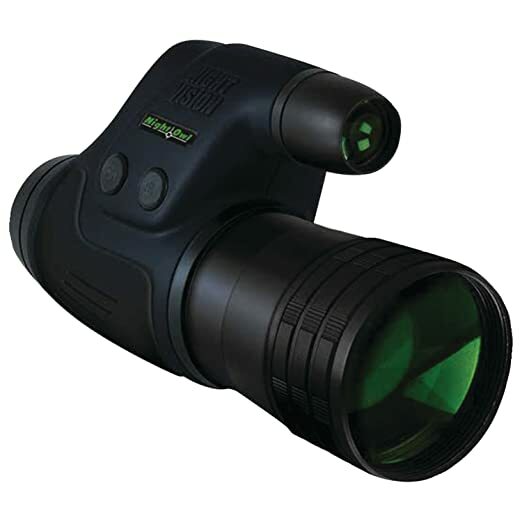 However, the Night Owl Lightweight Night Vision Monocular is relatively inexpensive and in my opinion is the best one for a low cost Night Vision Monocular. Check the prices of the other models below on Amazon. Sometimes you can get the best deal even on the 5X and most rugged version. I personally have the 3X Night Owl Monocular version and like it a lot. Afterwards, the 4X and 5X and marine versions became available so you may prefer them. Consider buying a Thermal Camera in addition to Night Vision optics. Click the following link for information on the Seek Thermal camera that attaches to a Smartphone. "Works pretty well. Impressively low price." "Just plain awesome for the price the view is close to crystal clear but the distance will blow you away." "It's great putting this night vision monocular up to my eyes and seeing in total darkness. I can now watch all those nocturnal creatures luring around my property (bobcats, beavers, owls, opossums, and raccoons)." "These are awesome at night camping or just playing around, they work great. Unbelievable clarity and vision with these in pitch black darkness. We use them camping to find animals at night." "This not only met my expectations, but it exceeded and impressed! I bought these on sale and thought what the heck. I got them read the instructions (IMPORTANT!) so I did not damage the unit. I waited until dark and was blown away on how far and how well I could see. I live next to a pond and there are a couple of houses around. It was unreal how far and how clear I could see. I would say 200-300 yards was crystal clear. I could see my neighbors rooms that were dark to my eye but they must have had a nightlight of some sort on. I was driving down the road the next day @ 5am and saw a deer to the side of the road. I had these with me and looked out into the field and there were 4 more deer, and one 8 point buck. I would have just thought there was the one, but these proved me wrong." "WOW very neat. Night vision is really neat. This thing is able to amplify any light at all. It takes a little getting used to but once you get it dialed in it works really well. My neighbors security light is over 150 yards away and I can't detect any useful light until I look use the night owl. Then the detail is amazing. The IR light works great outside. The first battery didn't last long but I think it was left on as the switch is easy to push." "Excellent, excellent, excellent!! Really like this scope, it is a great value! Buy the Panasonic 10 pack for the battery in this unit.... Night Owl Scope is clear and a real night lighter upper! Nice Quality, bright...."
"I am delighted with this product. It arrived well packed so that no damage would occur during shipping. Additionally while I have the 4X my neighbor got the 5X and both of us like the 4X better. It has dramatically clearer vision than the 5X." Works well for seeing in the dark at 20-150 yards. Has a lens +/- lens adjustment similar to binoculars to adjust to your eyes. You can see very well without using the IR illuminator function in minimal lighting where your eyes cannot quite see- it lights it up like daylight in the scope. The IR illuminator works well for longer distances and is like a powerful invisible flashlight beam that does not startle wildlife and lights up the view extremely well within its narrow beam range. Good quality for the amount of money. Russian made- not cheap Chinese garbage. Affordable if you want an entry level night vision device that allows you to see in the dark. So far, battery life seems to be pretty good- although I have not used the IR illuminator too much. Small field of view at distances, but still usable. Be careful not to look at bright lights up close and do not use in daylight as it can damage the unit! Takes a few seconds to excite the electrons and illuminate the scope when you first turn it on after it has been sitting awhile- so you could miss a brief nighttime viewing opportunity if not prepared in advance. I also found it difficult to focus objects at too close of a range, especially inside of 50 feet or so." "This NV is better than expected. I have never used expensive NV so i can't compare it, but what I can say is that it's pretty sharp picture with a nice field of view. One of the best gifts ever bought."